Gavel & Blocks are an integeral part of an orderly Masons meeting or Auction, comittee meeting. 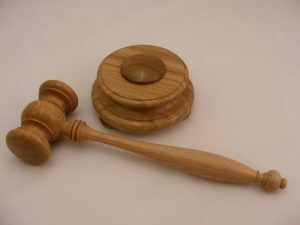 They can be simple a Palm Gavel or as in this case a Gavel & Block , the picture below is a craftsman made and has seven turnings incorporated into the set, and is made of Oak and Walnut. The block has three feet and a striker pad made of Walnut, the block is raised on the three feet to allow the sound to flow, it is also dished underneath for the same reason. They have been finished in a gloss finish so that they will not marr with handling.